I Hated My Neck Wrinkles! I've seen neck wrinkles and small lines on women as young as 30! But when you have sagging skin and that dreaded "turkey neck" look, that's a sure tell tale sign of your age. You can get rid of neck wrinkles, lines, and firm up sagging with neck and chin exercises. I'm living proof!! This awesome and dramatic change in my jowls, lower chin and neck is actually a combination of face and neck exercises that not only lifts the neck, but helps other areas of the face too. I've been engaging in different types facial exercise routines/programs since 1998. But back then many facial exercises programs didn't address the neck area. I was a bit shocked when I took the before picture and saw how bad it really was!! Sometimes you really don't realize how bad things are, you just slowly adapt, maybe I was in denial??? For example, while I noticed that I've developed some neck wrinkles I just stopped wearing turtlenecks because that just exaggerated the issue. Then over time, I stopped pulling my hair back....and so on until I realized that my neck was becoming a really aging issue. However, I didn't realize it was that bad until I took this picture from Up and Under my chin/neck area. OMG! I immediately searched for an exercise program that will address this along with keeping the rest of my face younger too. Unfortunately, this area is very thin, has fewer sebaceous glands, and is just as vulnerable to wrinkles and sun damage as the area around the eyes. That's why you have to remember to baby this skin with great anti-aging products and sunscreen! Yes! I never applied sunscreen to my neck, maybe that's why I had so many wrinkles? Well, now I not only baby the neck skin, but I do my neck exercises at about 2-3 times a week. It doesn't take long and it is SO WORTH MY TIME! I know it's not perfect, but the neck wrinkle pictures show results after only 12 weeks. Not bad for a cheap home alternative to fixing neck wrinkles and sagging neck/chin/jowls....Don't you think? Here is another very simple exercise to tighten the neck area and help reduce that "turkey neck" look and wrinkles. Now slide your open hand down your neck to your collarbone while stretching your up chin up toward the ceiling. 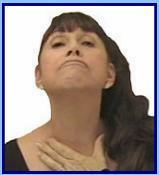 Hold at the base of your collarbone and make 10 gulping movement with your mouth - Like a fish. You should feel the muscles moving - from under your chin all the down to your chest. Just remember to keep your chin up pointing toward the ceiling the whole time. Want to try more sample exercises? Click Here! I hope you found this page helpful and if I can help another woman fix her neck wrinkles or sagging skin without paying for surgery - that will make me happy. I'm here to share what I found works for me and is natural, safe and inexpensive.